Peter is the chap in the photograph you see on the right. He’s the one wearing glasses. This was taken at some time in the nineteen nineties and to the casual observer, there is nothing remarkable about these two men. He and Eric Jackson – on the right in the photograph – are friends from way back when and both have fascinating stories to tell. 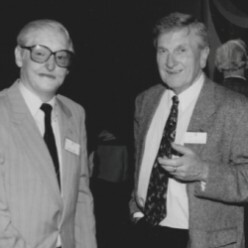 Both men are from Yorkshire and in their younger days, both drove competitively in rallies and races.Peter and Eric met when they were in their twenties due to their driving exploits – they’ve been friends ever since. Today, we’re telling Peter’s story. 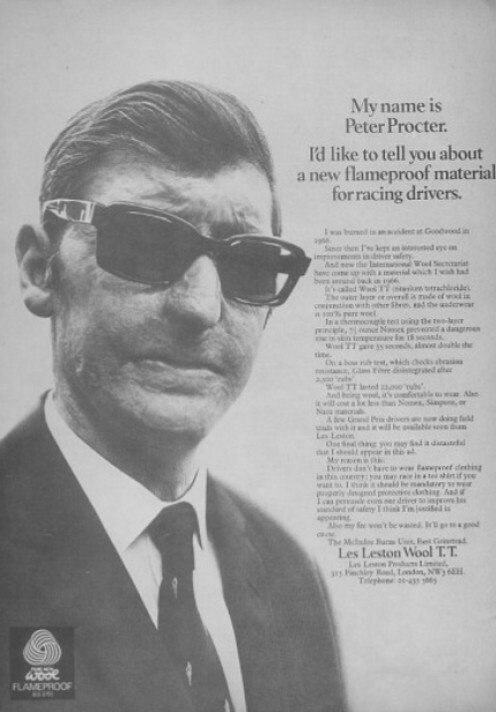 Peter did a lot of rally driving and also raced at Le Mans and in several Grand Prix races. 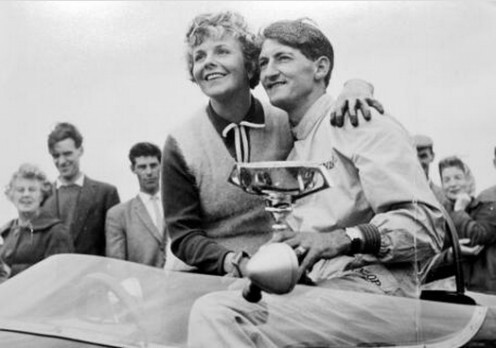 However, his racing career was halted in 1966. It was 1966. Peter took part in a saloon car race at the famous English circuit, Goodwood. Peter was racing what was in those days a successful competition car – a Ford Anglia. On the very first lap, his car was hit from behind. 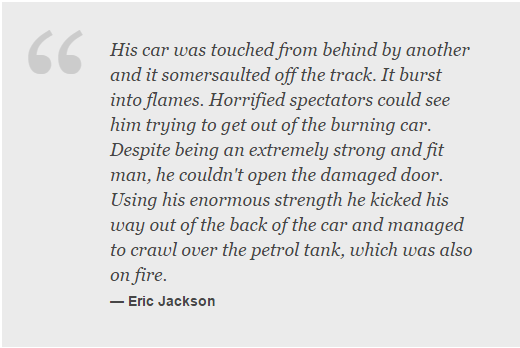 Motorsport is still dangerous today – for spectators as well as drivers – but in those days the safety standards were little more than primitive. 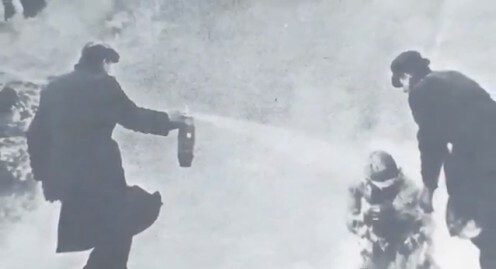 As you can see above, Peter became a human fireball and men in ordinary clothing (not Nomex fireproof suits) rushed to help him with a tiny fire extinguisher. 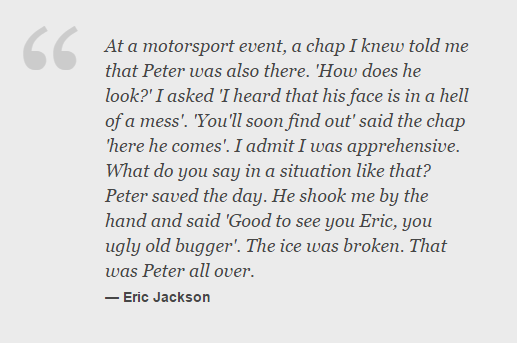 Today there are expert medical teams at racing circuits but that didn’t apply in those days. But Peter was eventually airlifted to hospital suffering from third-degree burns. They covered sixty five percent of his body. When this is the case, it is unlikely that the patient will survive. But survive he did. Of course, he needed a lot more surgery as the years passed by. But Peter now had a further mission. In the sixties, many drivers realised that the death and injury rate that was so horrendous in the sport needed serious attention. He was adamant that something should be done to change the regulations so that others wouldn’t suffer as he had. 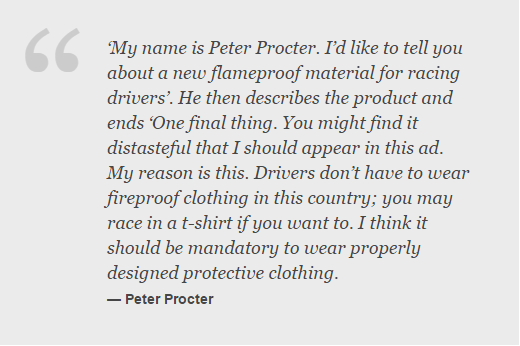 Of course, just like anyone who appears in an advertisement, Peter was paid. Some cruelly wondered if this was why he had chosen to appear. But anyone who knew Peter also knew that he wasn’t like that. He gave his entire fee to the McIndoe Burns Unit where he had been cared for after his accident. The unit continues its work today. Below you can see its current patrons. It is still treating men and women who have been burned in conflict, children and those who – like Peter – have suffered burns in accidents or housefires. 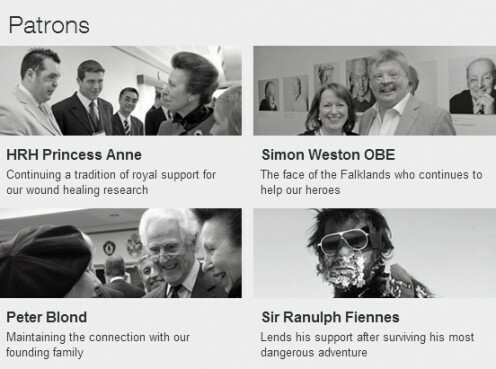 It is dependent on donations and you can find out more here. Find out more about its work in the war and today in the video below.